EU countries which have established strong trade relationships with the US are likely to profit most from the Transatlantic Trade and Investment Partnership. But the deal could also benefit those with more limited economic ties, if the Union deepens its internal market, a new study found. A comprehensive TTIP agreement will lead to a permanent increase in GDP levels for 27 member states ranging from 0.3 to 1.6%, according to the newly published World Trade Institute (WTI) research, that has outlined the economic impact of the deal on the individual member states. Malta is the only member state to see a 0.3% decline in national income. Researchers reckon that the reason for the negative impact is the traditional trade relationship between Malta and China, Canada rather than with the United States. Member states like Lithuania, Ireland, Belgium, Luxembourg, Cyprus and Germany, whose economies are highly integrated in the global value chain with the US, will likely see the largest increases in GDP and exports. For example, Austria which has a strong economic relationship with the US, could register a 64% jump in exports, driven by the machinery, motor vehicle and chemical sectors. By reducing both tariffs and non-tariff barriers (NTBs), car parts and components by firms in Austria are expected to increase by €2.5 bn, while for Austrians, the price for an average car could go down by 1.6% because of TTIP. Similar patterns are foreseen for Slovakia, whose exports to the US are forecast to increase by 116%, 48% in Sweden, by 38% in Germany, 36% in Hungary and 35% in Bulgaria. Crisis-hit countries like Greece, Italy, Spain, Portugal and Ireland are expected also to see some gains in exports, ranging from 13 to 26%. “There is an incentive for the EU to enact policies that deepen the EU internal market and for EU national government to enhance their economic relationship with the US through complementary domestic policies,” said professor Joe Francois, lead author and managing director of the WTI, presenting the report. He added that such measures would amplify the potential for economic growth from TTIP. Even though economic gains are projected to come mostly from more production and exports and investments, they could also come from lower consumer prices. “If the deal delivers on an ambitious regulatory alignment and coherence in areas of equivalent standards, it will cut costs for EU and US producers. If companies pass these costs on to consumers, TTIP will help lower prices for consumers and more profit and turnover for companies,” said Francois. According to the study, Lithuania is expected to see the largest drop in consumer prices , mainly in cars (-3.8%), food products (-1.3%) and business services (-0.7%). Findings also show that TTIP could promote a race to the top on labour, environmental and health and safety standards on both sides of the Atlantic. EU wages for both low and highly skilled workers are expected to increase by roughly 0.5% in average, which peaks for Irish skilled workers (1.4%). From an environmental perspective, “Fears of regulating downwards environmental protections in the EU are unfounded, since the focus for negotiators is on upholding protections while enhancing regulation in compatible areas, and also because TTIP does not seek to legislate,” reads the report. The risk of a supposed “regulatory chill” on governments’ right to regulate on environmental issues is low, since the EU negotiating mandate explicitly states that the pursuit of “legitimate public policy objectives” will remain the prerogative of national governments, the report insists. Rather, better regulatory practices, improvements in efficiency and technology and increases in the trade of environmental goods could de facto offset the negative impact of additional emissions. As for the Investor-State Dispute Settlement mechanism, the new report favours the idea of an Investment Court System (ICS) as a model to balance the interests of states, businesses and the public interest. The European Commission has estimated that an ‘ambitious’ TTIP deal would increase the size of the EU economy by around €120 billion (or 0.5% of GDP) and the US by €95 billion (or 0.4% of GDP). 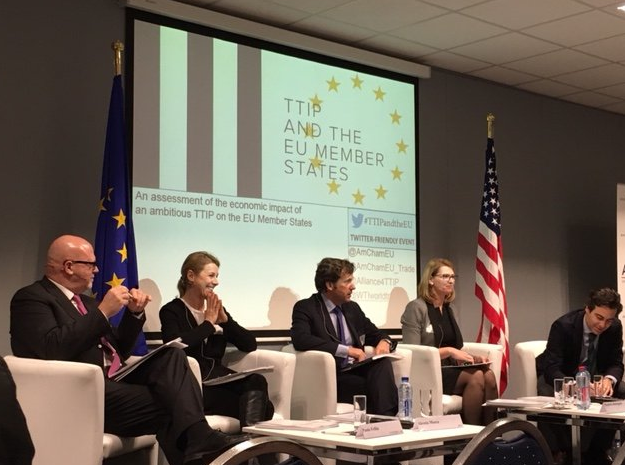 Economically, TTIP can benefit consumers from creating cheaper products, according to the Commission. A study by the Centre for Economic Policy Research estimates that in total the average European household of four will see its disposable income increase by an estimated €500 per year, as a result of the combined effect of wage increases and price reductions. This would be a permanent increase in the amount of wealth that the European and American economies can produce every year. Adjustment in local labor markets is remarkably slow, with wages and labor-force participation rates remaining depressed and unemployment rates remaining elevated for at least a full decade after the China trade shock commences. Exposed workers experience greater job churning and reduced lifetime income. At the national level, employment has fallen in U.S. industries more exposed to import competition…but offsetting employment gains in other industries have yet to materialize. Main street Americans oppose anymore “free trade” deals with all countries.